Hi Fi Racks Podium review | What Hi-Fi? Wood, that hardy by-product of the tree, seems to be making a comeback in hi-fi accessories, and that's a good thing. We've already dished out five stars to Hi-Fi Racks' Podium equipment rack, and here the matching speaker stands are put under the spotlight. These handmade oak Podiums retail in three- and four-legged formats, and in natural satin or black oak finishes. Easy to build, they come with isolation spikes and are very weighty. 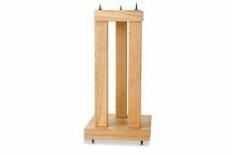 Optional plinths are available (£50) that fit between the floor and stand base. These stands work best with the supplied top-plate spikes, and using B&W's 685s together with EB Acoustics' EB1s, the Podiums serve up a warm, wide sound playing Kanye West's Love Lockdown. The midrange sounds sweet and the treble integrates well. Bass is reasonably tight and defined, although a touch more detailing would be nice. Using the optional plinths, we found the sound became narrower and lost expression and detailing. The Podiums are stylish and are ideal for those with bright-sounding kit and a penchant for wooden furniture.